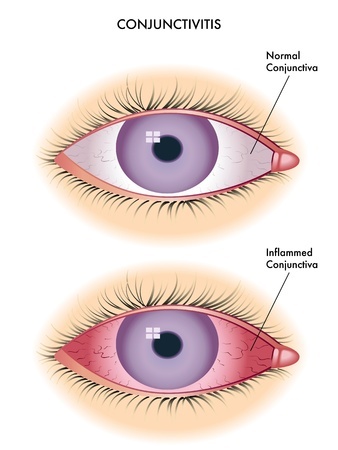 Pinkeye is another name for conjunctivitis. This is characterised by redness and swelling of the conjunctiva – the mucous membrane that lines the eyelids and the surface of the eyes. As the name might suggest, this often leads to the conjunctiva becoming red and in some cases swollen whereas it would normally be clear. Fortunately, pinkeye is relatively harmless and is self-limiting after about 7-10 days with no need for medical intervention. Like tinnitus, the term ‘pink eye’ or ‘conjunctivitis’ does not so much describe a condition as much as a symptom. That means that there are numerous potential causes for pinkeye and this will dictate whether the condition is contagious in each case. In some cases, pinkeye may be caused simply by dry eyes, by rubbing the eyes too much, by allergies such as hay fever or by chemicals, fumes and smoke. All these things can cause the eye to look red and swollen and to feel itchy and painful. However in other cases, pinkeye is caused by bacteria or viruses. It is in these situations where pinkeye is contagious and where it is important to take care. For this reason, it is very important to try and identify if your case of pinkeye might be viral in nature. While a number of viruses can cause pinkeye (including herpes), the main cause is adenovirus – a common respiratory virus. You can also identify viral pinkeye by ruling out other potential causes. If your pinkeye doesn’t subside overnight for instance, then it is less likely to be caused by irritation. Likewise, if you don’t have any other symptoms of hay fever or don’t normally suffer from allergies, then this can rule out that option. Viral pinkeye will usually tend to being to show signs of improvement after 3-5 days. If this doesn’t happen, then you might want to see your doctor to be checked for herpes infection. Herpes can be treated with antiviral medicine but is a relatively rare condition. Doctors can also prescribe eye drops for other causes of pinkeye which may help you to feel more comfortable. In rare cases, viral pinkeye symptoms can persist for up to 3 weeks or even become ongoing/chronic. Until you are absolutely certain that your pinkeye is not caused by a viral infection, it is a good idea to act with caution and to avoid contact with others. The bacteria can spread if you share towels or dish cloths, if you fail to wash your hands properly or if you directly touch the face of others. While symptoms persist, use a separate towel, take extra caution when washing your hands and instruct others in your household not to touch their face. You should take time off of work or school for at least the first three days. While it is hard to know exactly how long adenovirus will remain contagious, it is usually considered safe to return once the symptoms have begun to subside. Adenovirus can also be picked up from swimming pools and you should certainly avoid these (or sharing a bath) while you have the condition. Women should discard items such as mascara brushes to avoid reinfection.